“Where are we supposed to be?” Donna asked. “Yes. You’re not telling me that YOU support Preston North End?” She laughed the laugh of a supporter of a team that was sitting in the top half of the Premiership in the presence of a supporter of one languishing in the middle of the Championship table. “Go outside and find out!” He flashed her a wide grin and bounded towards the door before she could protest about being sucked out into a void. She sighed and ran after him. She could see that it wasn’t a void. There was something outside. “Donna, don’t close the door,” he shouted out, a second after the door closed with the click of the latch. He groaned and put his hands on his head in frustration. She held up her own hand and stared at it. Her usual skin tone was a clean cream colour, not too tanned, not pale either. But right now she was a pale grey. So was The Doctor. Her dress which had been green and white, was grey and white. The Doctor’s tan coloured coat was a light grey. His brown pinstripe suit was dark grey. His face was shades of grey. The world around her was like being inside a black and white television programme. The inside of the TARDIS was gone. Everything that was the TARDIS. Inside the police box exterior was a police box interior – a wooden box with a bench along the back where a policeman could put a prisoner until the van arrived to take him away. The Doctor tapped the wooden walls desperately. Donna walked around the outside, pressing her hands against it and noting that there was no vibration any more such as she had noted the first time she saw the TARDIS, the vibration she had ceased to notice until now, when it wasn’t there. “One question at a time, please, Donna,” The Doctor begged in a weary, worried voice. “No,” he admitted as he rested his head against the wooden door and noticed the lack of a psychic connection with his TARDIS, something he had felt for nearly a millennia before this. “Where are you?” he whispered, talking to the absent TARDIS, not to Donna. She looked around. They seemed to be in the high street of a small town, outside its police station. She noticed what should have been a blue lamp over the front door and a board with various posters and notes. The most recent one was dated June 20th, 1955. She turned and looked at the street. There were no big supermarkets or chain stores. There was a greengrocers, a grocers, baker, butcher in a row. Next to that was a cobblers and a small dress shop next to a men’s tailors. A hardware shop was next to that, and a barbers. Right at the end of the row was a cinema, showing a film called The Ladykillers. She vaguely remembered seeing it once on a Saturday afternoon. It was one of the old ‘Ealing Comedies’ as they were called. That was exactly what the scene around her reminded her of. Those 1950s British made films. The cars, including the black car with ‘police’ on the front grill that was parked on the apron in front of the station, reminded her of that kind of film. The people she saw coming in and out of the shops were all dressed in fifties fashions. And it was all in black and white. She stopped speaking as a uniformed policeman and one who must have been a plain clothes officer stepped out of the station. The uniformed man got into the driver’s seat of the car. The other turned to The Doctor and spoke to him. “Er…. Yes, of course.” The Doctor stepped towards the car. Donna followed him. The plain clothes man looked at her curiously. He opened the back door of the Wolseley 6/80 and held it for Donna to climb in first. As he sat beside her she searched for a seatbelt, but there wasn’t one. The car stopped on the gravel in front of a substantial stone built house, maybe a century old. There were steps up to the wide front door, which was opened by another uniformed policeman – a constable - who probably owned the bicycle that was propped against the bottom of the steps. “He’s in the study, sir,” the constable corrected himself. “Er… he’s… it doesn’t look so good. I don’t think….” He looked at Donna pointedly. “I… don’t have a notebook,” she replied. “I’m not in my uniform. Then she reached into her coat pocket and to her surprise there was a police notebook and a sharpened pencil. Funny, The Doctor thought, not because he found himself instantly stepping into the study without having walked to it, but because he had called the Detective Sergeant by name and he hadn’t even known his name until that moment. He decided to worry about later. Right now there was a body to examine. It was lying on the floor beside a big oak desk and an upturned chair. Somebody had put a tablecloth over it. He crouched down and lifted the cloth. The constable was right about one thing. The body wasn’t pretty. The back of the head was a bloody pulp of hair, skull and brain tissue where the disintegrating bullet had exited. A much neater hole where it went in was between the eyes. The phrase ‘dum-dum bullet’ popped into his mind from somewhere. He also noted that the bullet was fired at very close quarters – the gun pressed right against the forehead. There was a tell tale ring of burnt gunpowder on the flesh. He quickly looked around to see if the gun was near the victim, which might suggest suicide, not murder. There was none. He turned back and looked closely at the deceased. He was in his mid fifties, slightly overweight as if he was used to being active but had gone to seed a bit in retirement. He was dressed in a tweed suit and had the sort of military moustache that reminded The Doctor of his old friend, Lethbridge-Stewart. He just knew that the victim was going to have a name prefixed with ‘Major’, ‘Colonel’ or possibly ‘Brigadier’. He stood up and walked around the room carefully. The tipped over chair was the only sign of a struggle. There was no open safe or plundered drawers. There had been no robbery. He examined the papers on the desk and allowed himself a satisfied smile as he discovered that the victim was, indeed, one Colonel Cosworth. The Detective Sergeant went to do that. The Doctor reached into his coat pocket for his sonic screwdriver. He was surprised to find it wasn’t there. “Of course!” he murmured. “It belongs with the TARDIS. 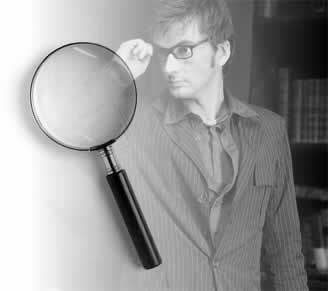 I’m Detective Inspector Smith of….” He found what should have been his psychic paper. Instead it was a warrant card identifying him as DI Smith of the Hertfordshire Constabulary, based, apparently, in the station at Hadleywood. A fictional town. There was no such place in Hertfordshire. Anyway, no sonic screwdriver, no psychic paper. He would have to sort this out using his own wits. Good job he had plenty. He turned back to the body and touched the flesh. He measured the temperature as sixty degrees Fahrenheit, a good twenty degrees colder than a living Human being. Given the ambient temperature in the room, that meant he had been dead at least…. The Doctor shook his head and then shivered in fright. That wasn’t good. He actually lost himself for a few seconds. He felt as if he was DI Smith. He went to the window and examined it carefully. It was a casement type and open about an inch for fresh air. But it was only a few feet from the ground. Somebody could have got in that way and closed it on the way out. He reached in his pockets. Apart from the sonic screwdriver and psychic paper everything he usually carried was in there. including a pair of surgical gloves screwed up in a ball in the bottom corner of the left pocket. He opened them out and slipped them on before he lifted the casement and looked out. “Sergeant?” he called going to the door of the study. He was surprised when it was Donna who came to his call, not the Detective Sergeant. Even more so when he saw she was wearing a police woman’s uniform of straight skirt, navy blue stockings, sensible shoes, blouse, jacket and cap. At least he thought he said Donna. The name that actually passed his lips was Elizabeth. And Donna’s reply surprised him even more than that. She came closer and The Doctor was surprised when she put her arms around his neck and kissed him. He had a strange flash of memory – music played on strings and piano rose dramatically while curtains blew in at a darkened window and a bedroom door closed – a 1950s film flashback on a night of passion that had apparently taken place between Detective Inspector John Smith and Sergeant Elizabeth Waters. “What kind of a film are they making?” he murmured as she stopped kissing him and adjusted her cap. “What was that, John?” Donna asked. Even her accent seemed different. She sounded like a middle class grammar school girl who had been taught to speak ‘properly’. “Yes, Detective Inspector,” Sergeant Waters answered, remembering her professional relationship with her superior. She gave him the notebook and scurried off. He headed for the drawing room, again finding himself there without doing very much walking. The two uniformed policemen were there. He sent one of them to go and assist the Detective Sergeant in what would be called forensic policing in another thirty or forty years. He wasn’t sure what they called it now. He stood and glanced briefly at the assembled witnesses/suspects and then very carefully and deliberately opened Donna’s notebook. He noticed that it began with neat and efficient pitman shorthand and then changed halfway through the sentence into longhand when the persona of the police woman took over. Sergeant Waters had obviously no plans to be a secretary. From the notes he gleaned that the older woman sitting by the window, sobbing into her handkerchief, was the widow, Mrs Margery Cosworth. The younger woman, in her mid-twenties, was her unmarried daughter, Lavinia. The boy, aged eighteen, was Nigel Cosworth, their son. The cook was Joan Fielding and the maid’s name was Mary Walker. Of them all, the maid was crying the loudest and hardest. She was a plump girl with clean, well scrubbed cheeks and hands that looked like they spent too much time in carbolic soap suds. The Doctor stepped towards her, crouching by her side as she sat on a straight backed chair looking out of place in the room she normally just dusted and polished. “You found the body?” he guessed. That was about as much evidence as she could possibly give even if she could stop crying. The Doctor managed to get a confirmation of the time when she went to begin her dusting. But that was about all. That got the last of the policemen and the domestic help out of the room. Now he could concentrate on the family. Detective Inspector Smith looked at the witnesses and then stepped towards the widow, first. The Doctor shook his head. It almost happened again. Donna was gone. He was fading in and out. If he lost himself completely, could he ever get back? Would he be trapped here, as Inspector Smith, forever? 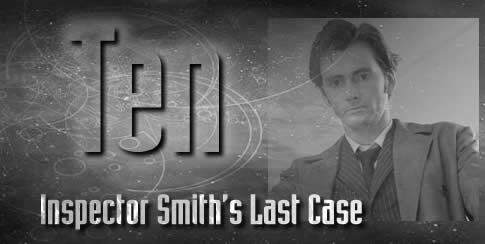 What would happen to The Doctor if Inspector Smith took him over? And just how real was this monochrome world, anyway? Were these people even real? If this was a film, weren’t they just fictional characters. They seemed pretty much stereotypes anyway, the sort that pop up in every run of the mill detective story. The bit of back story about Smith and Sergeant Waters was about the only different bit. That was a touch of spiciness for a British film of the nineteen-fifties. Fictional characters or not, his instinct was to sympathise. Mrs Cosworth had lost her husband. She was inconsolable. “Did your husband have any enemies?” The Doctor asked gently, in between sobs and gushes of tears. Smith paused. He felt strange. He didn’t remember asking the first question. Ohhh, The Doctor thought. It’s getting more frequent. Assuming Smith to be in his mid to late thirties, that was a plausible answer to the question, and one that gained him some kudos in this family with military history of their own. “Yes, mama,” the boy said and rose from his seat to go to the drinks cabinet. He half filled a glass with slightly melting ice from the dispenser drawer and then topped it up from the soda siphon. The Doctor accepted the drink gratefully as he paid attention to Mrs Cosworth again. “So,” The Doctor thought. Three suspects, three motives. “I see… well, that seems to be in order. All I need to know now is where each of you were at the time of the murder – which we believe to be about nine o’clock this morning. That’s when we believe the intruder broke into the study and disturbed the Colonel. “Quite possibly,” The Doctor answered. “Quite possibly,” Inspector Smith echoed. He looked around at the window to see Sergeant Waters hurrying across the lawn towards the house. Detective Sergeant Miles and the uniformed Constable were coming along at a slower pace, carrying something. He left the drawing room and reached the hall as Sergeant Waters ran in. He stepped out of the house as the Detective Sergeant arrived. He examined the evidence cursorily and told the constable to stow it safely in the boot of the Wolseley, then he sent them both back to the copse to see if they could pick up the trail again, though he doubted it. He really just wanted them out from under his feet while he got on with the job. “Oh!” Sergeant Waters beamed with joy. Despite being in uniform, and on duty, and at a crime scene, she reached up and kissed him with all the passion that a character in a black and white British film of the 1950s could display. “Yes, John,” she answered. She came with him into the study, averting her eyes from the covered body as the Inspector found the keys to the drawer and unlocked it. He took out a box and opened it with another key. Inside was a handgun. A Webley, he thought at first glance. Standard issue for army officers in the war that ended ten years ago. “Waste of time. There won’t be any.” He looked around and his detective’s instinct told him there was something else about this scene of crime that didn’t meet the eye. Sergeant Waters looked around. It took her a while, but then she realised what he was getting at. Her eyes widened. It took the blink of an eye to return to the drawing room. Mrs Cosworth and Lavinia were sitting together by the window, comforting each other. The son was sitting by the fireplace, very quiet and still. “Please let me do my job,” Inspector Smith asked her quietly before turning back to the son. “Show me your hands, Nigel.” Nigel raised his hands slowly, palms down. “The other way up.” He turned them around. The Inspector noted that there were blisters on his fingers as if he had touched something hot. For some reason the word ‘epithelial’ came into his mind but as he had no idea what the word meant he passed over it. “Mmm.” Inspector Smith walked around the room, slowly, looking at the three family members. As he did so Sergeant Waters came in to tell him that the ambulance had arrived to collect the body and that Detective Sergeant Miles was dealing with it. “You do?” Sergeant Waters was surprised. He paused and watched the faces before him. Did somebody look relieved? “What do you mean, Inspector?” Mrs Cosworth asked. 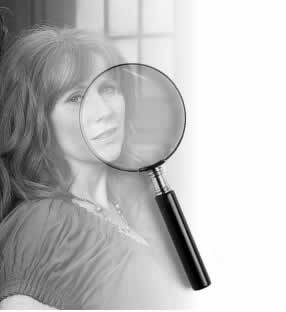 “I can’t imagine, Inspector,” Lavinia said. “Perhaps…” She stopped. She couldn’t think of any plausible explanation. “I didn’t kill my father,” Nigel protested. Beside him, Donna, still in the persona of Elizabeth Waters, gasped in shock. The exclamations of the family were much louder, but for very different reasons. Yes, Inspector Smith would. His persona had occupied The Doctor’s mind long enough. He knew him. He would be kind, sympathetic, but he would arrest them and let the courts decide their fate. But I'm The Doctor. And I do things differently. “You really mean that…” Mrs Cosworth was completely overcome. Lavinia and Nigel both looked at The Doctor gratefully. Sergeant Waters turned and followed him out to the hallway. There she stopped and gripped his arm. He looked at her. At that she reached and kissed him again. The Doctor sighed. As he said her name, he looked at her and blinked in surprise. She had red hair underneath the dark blue police cap. She was in colour. He looked down at his own brown pinstripe suit and tan coat. He looked around at colours that startled him after being in a black and white world for so long. They weren’t in The Grange anymore, either. Nor was it midday as it was approaching when he left the Cosworth’s to their own devices. This room was in bright sunshine of an early summer morning. The curtains were pulled across to let in light and air from the window. It was clearly a sick room – that is to say that somebody was sick in it, not that the room was sick. The sick somebody was lying in his bed, beside an array of pills and bottles on the cabinet. He was awake and looking at them. “Hello,” he said in a quiet voice. The Doctor stepped towards the bed and helped the surprisingly light man to sit comfortably with his pillows propping him up. The Doctor poured him a glass of water from a jug and he drank gratefully. “Are you kidding?” Donna replied. “You can’t turn on the TV without a cop show somewhere. The Bill, Inspector Frost, Law and Order, CSI, reruns of The Sweeney and Juliet Bravo on UK Gold….” Donna stopped talking. Mr Montgomery looked very puzzled and The Doctor was giving her the look he reserved for when she was talking too much. The Doctor turned, feeling a bit silly for not having done so before. The TARDIS was right there, by the bedroom door. He reached out and touched it and felt the familiar vibration. He reached for his key, which was in the same pocket as his psychic paper and sonic screwdriver, and unlocked the door. He went inside and looked around his familiar console room before stepping back outside. He didn’t. The TARDIS seemed unaware of anything unusual occurring. Nothing was wrong with any of its circuits – at least nothing that wasn’t already wrong, or that didn’t matter. Instead he moved to the database and found something else to look up while Donna was busy. When he stepped out again, she was closing the notebook. The story was written. “We’ll try,” Donna said to him. “Goodbye,” Donna said as The Doctor took her arm and they stepped into the TARDIS. He closed the door. She watched Mr Montgomery wave to them on the viewscreen before the TARDIS dematerialised. “I thought you looked rather fetching,” The Doctor said.